Year One: Hendry Update. Dave Rogers. Five pages. A precis of 'Brought To Book', the second episode of the series. A New Direction: Enter Cathy Gale. Dave Rogers. Twelve pages. A look at the evolution of the show between the end of Season One and the broadcast of the first Cathy Gale episode. Mrs. Peel You're Still Needed. Fletcher C. Chan. Four pages. 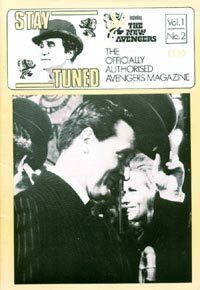 Reprint of a piece from The Ryder Magazine #74, June 1986 about repeats of the Emma Peel episodes of the show. Curry A La Carte. Stephen & Joy Curry. Four pages. Regular information on the current activities of various Avengers luminaries. Motoring: Avengers Style. Geoff Barlow. Three pages. A look at the vehicles used in the show by Emma Peel.